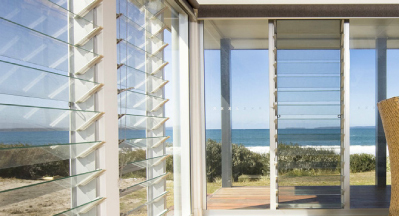 Adjustable louvre window system designed to complement the Vantage Designer Series windows and doors. The jambs, head and sill will clip to all Designer Series products. The 131mm wide frame allows a flyscreen to be fitted within the frame line without the need for screws, rivets or unsightly turnbuckles – giving a clean flat finish. The LouvreMASTER™ system has been successfully tested to 300Pa water resistance. Standard blade heights are 152mm and 102mm, choosing a frame size which allows you to use all full height blades will always give the best appearance (i.e. no need for blades to be cut down). The 102mm and 152mm blade can be glass, aluminium or timber. There are two mullion strength options to cover most situations, Including Darwin up to 3000Pa design wind load. Fixed inlay adaptors make it possible to have adjustable louvres and fixed lights within the same frame. Head and sill run through, this makes it easy to fit louvres over doors using one of our highlight couplers. 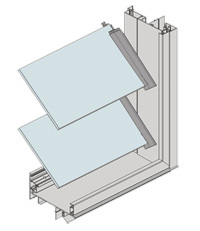 3° fall in sill ensures water, dust and salt are guided out of the window system. This window is available with an optional built-in security bar system. Louvre mechanisms can be key locked.